"[It] has multiple meanings. For example, 'target' could be an individual person, a group, or an organization composed of multiple individuals or a foreign power that possesses or is likely to communicate foreign intelligence information that the U.S. government is authorized to acquire." Moreover, numbers are given for business records requests; instance where business records were specifically requested by the US government. While only numbering in the hundreds (178), the word "target" is used once again, which the US defines in an extremely loose way. As such, once more, it's unclear exactly how many US citizens were affected and how. 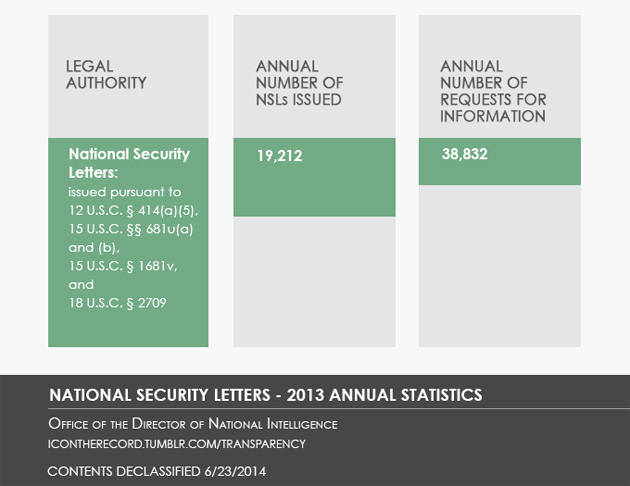 There's also a stat breakdown of national security letter (NSL) requests in 2013. Historically, NSLs were used in financial matters -- they're subpoenas for electronic records, as ordered by the Federal Bureau of Investigation (FBI) -- but their use was expanded under the PATRIOT Act of 2001. These are particularly important to surveillance, as they order record holders to turn over otherwise private information, cannot be challenged, and even require the records holder not to tell the individual(s) or entity that their records are being given to the US government. The report is slightly more specific in respect to NSL requests: 38,832 requests were made for records and 19,212 were approved. The report says those numbers skew far higher because, "the FBI may serve multiple NSLs for an individual for multiple facilities, e.g., multiple e-mail accounts, landline telephone numbers, cellular phone numbers, etc." In plain English: multiple NSLs might be issued for the same person or entity. The report is in response to President Barack Obama's June 2013 directive to the Director of National Intelligence to issue a transparency report. Obama's directive, of course, is in response to the deluge of NSA leaks last summer led by Edward Snowden.